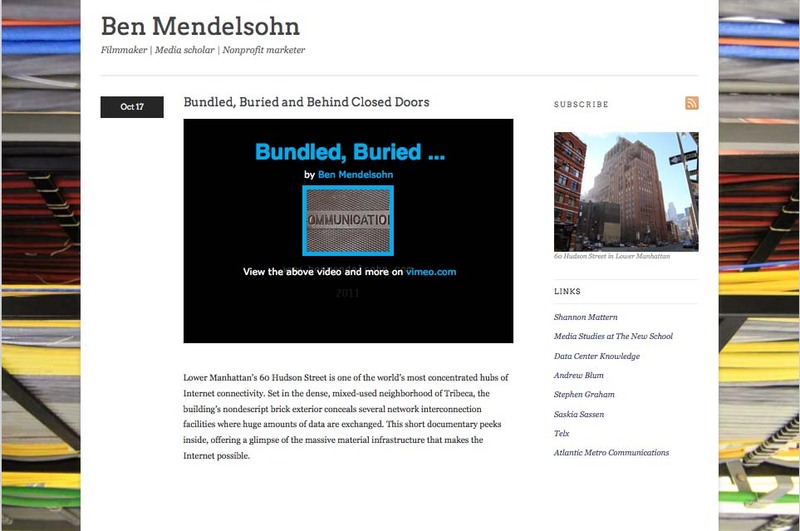 My fantastic thesis student Ben Mendelsohn has a new website — and a final cut of his video on internet infrastructure in Manhattan.This work began in Spring 2009, while Ben was taking my “Media & Architecture” graduate seminar; he drew inspiration from the work of Stephen Graham & Simon Marvin, Kazys Varnelis, and Andrew Blum, who took my Fall 2010 “Urban Media Archaeology” class (which Ben audited) on a walking tour of Lower Manhattan’s physical telecom networks and nodes. Ben won the Distinguished Thesis Award and the Dean’s Commendation, and he was named our Spring 2011 commencement speaker. In short, he’s awesome. Bundled, Buried & Behind Closed Doors from Alex + Ben on Vimeo.